The Nintendo 64’s time may have passed, but the console has been living on as of late through some of the early releases from Nintendo on the 3DS. We have already seen Ocarina of Time get a fantastic makeover thus far, but now the spotlight belongs to a certain fox that captured our attention over 14 years ago in Star Fox 64. The control scheme, dialogue, and overall charm of the game completely set a standard for the once niche genre of on-rails shooters and cemented the franchise as a household name in gaming all over the world. Looking to recapture that magic, Star Fox 64 3D boasts the obvious 3D presentation with a brand new coat of paint and utilizes the gyro controls to let players experience the classic in a whole new way. So how does this port live up to the legacy of it’s predecessor? 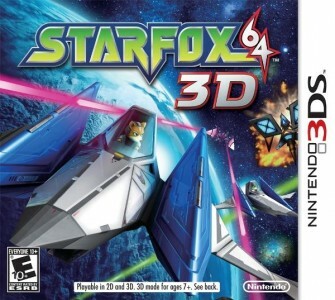 Here is my review for Star Fox 64 3D. Most of you should know this tale like the back of your hand if you have ever played the original, but I will provide a quick run down just in case you missed out years ago. StarFox 64 3D takes place three years after James McCloud was captured by Andross due to a betrayal by the villainous Pigma. 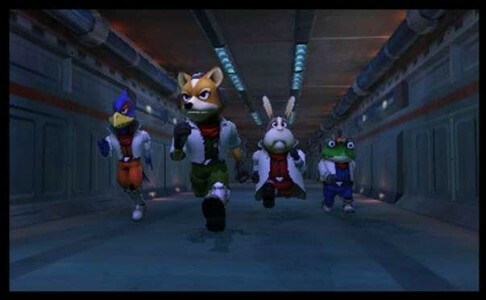 Peppy Hare, an original member of the Starfox team learns that Andross is at it again with his old tricks and recruits James’ son Fox McCloud to lead a small squad through the Lylat System to put a stop this potential threat once and for all. Yes, it’s the same exact plot we seen years ago with not one change made to any of the main narrative. That isn’t a bad thing at all though, as the production values that went into this port are superb and even though I played the original countless times, I couldn’t help but feel like I was playing the game for the first time all over again. Characters have remained about the same as far as personality goes as well, with all the trademark catchphrases (DO A BARREL ROLL!) and puppet-like personas left completely intact while remaining as clever and charming as they ever were. 14 years ago, the whole concept of an on-rails shooter was not really something I was fond of, but Star Fox 64 completely changed my opinion of the genre completely as it was easily accessible and literally set a bar that has never been passed in terms of actual gameplay. As Fox McCloud, the player is pulled throughout a set number of levels where the main concept is to survive until the finish while performing certain objectives along the way. Sometimes these tasks are just to ensure that you and your team pass through safely, but other moments will open up the area to let the player roam around to take out a specific target. Once you move through a planet, new paths open up that let you progress further. Unlike the original however, players are now allowed to choose the next area rather than to be forced to stick with their original preset destination. It’s a small touch, but definitely one that stood out quickly and got rid of one of my only complaints with the original. Like the story, the gameplay in Starfox 64 3D is relatively the same, but Nintendo added in a whole new control scheme to give the game a fresh breath of wind to live on through the gyro motion-based controls. 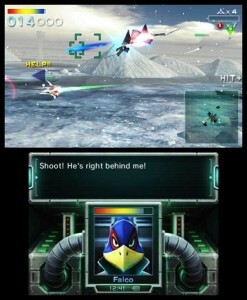 This function allows players to maneuver their Arwing by moving the 3DS itself. Since most of the experience is played on rails, this usually means that the most the player will have to do is simply tilt the system in a specific direction to get a new perspective on incoming targets. For instance, if little Slippy Toad is being shot at and is in dire need of assistance, the player can quickly pull their handheld into that direction and easily take care of any threats with very little problem. I imagine some would be weary of this control layout as it might sound a bit awkward to actually move the 3DS to control your ship, but after playing the whole game in this new mode, I can easily say that the whole gyro mechanic was very polished and perfectly complimented the face-button controls scheme. Those who would rather not worry about the new gyro gimmick are also in luck, as there is an extra option from the start to complete Star Fox 64 3D in “64 mode”. 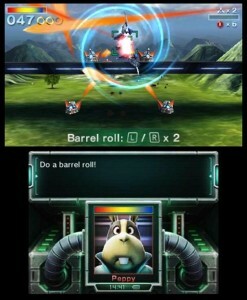 This allows players to utilize the slide-pad for movement and execute special techniques or shoot with the buttons provided on the handheld for a more classic feel. Firing from your ship is never a chore as it’s as simple as tapping the A button to launch a shot. Holding down the button will also allow for Fox’s Arwing to lock-on to incoming aircraft and deliver a much more powerful attack. Other abilities such as performing a somersault are handled by braking and using the stick together in one swift movement or by tapping the correct direction on the D-Pad, alternatively. Thankfully, 64 mode is quite close to the original scheme and it really shows while you are playing the game as the clever mapping and slide-pad work wonders to not only control Fox, but also to deliver a more nostalgic and exciting experience. It honestly shouldn’t take most more than two hours to finish the entire game, but yet again, this hasn’t changed from the first incarnation of Star Fox 64 so it isn’t really a big deal. Star Fox 64 was never a game that you just finished one time anyway as the multiple paths, secrets, and the newly added in medals give a ton of replay value that can keep this cartridge relevant for years to come. There is even a score attack mode that lets players replay each stage and aim for the top score based on speed and enemies destroyed. Those who want to take to the skies with friends are in luck, as 64 3D features a newly re-tooled multiplayer mode. 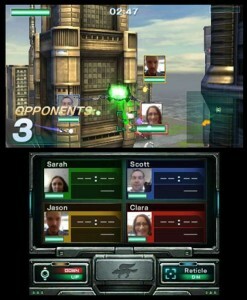 This mode lets up to four players go up against eachother in three different battle contests such as survival, timed battle, and point battle. As an added feature, all pilots can use the built in camera to give a live stream of their face instead of the puppet avatars from the past. This feature goes a long way to make the experience more rewarding and even lets the winner sport a crown upon victory for some nice bragging rights. Sadly, all these extras are just for local play though as Star Fox 64 3D has no online mode. To help soften the blow, there is a download play function included that allow all other players to battle with only one cart present, but I truly felt this was definitely an area of untapped potential as online play would have brought about THE definitive Star Fox experience, rather than just a well-made port of a classic. There may be just a few subtle changes to the main game of Star Fox 64 3D, but the most standout addition within are the enhanced textures and the shiny new presentation as a whole. Yes, Fox and friends look great this time around as well, but the redesigned environments, enemies, and Arwings all have been given a nice graphical update that bring this remake into the year 2011. The 3D effect is also hard to ignore as fallen enemies and explosions all “pop” off the screen and each stage now has an added layer of depth which in turn makes everything more much more immersive and enjoyable overall. With any on-rails game, I feel visuals are very important as you are literally being pulled through the game and thankfully Nintendo spared no expense to make this remake a visual spectacle for players new and old. As far as the soundtrack goes, all of the famous melodies you remember are back and sound better than ever as each track has been orchestrated and make the trip through the Lylat System feel like a whole new experience. Voice acting has also gotten a fresh treatment with nearly all of the original cast returning to bring the Star Fox crew back to life. From Falco degrading your shooting skills to Slippy’s high pitched whining, everything sounds just as good as it did years ago and delivers pure nostalgia from beginning to end. 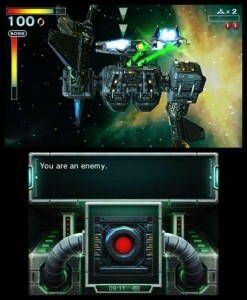 Star Fox 64 3D has just about everything you would want in a remake. If you by chance are still hanging onto that old cartridge for the memories, it’s time for retirement as this version improves upon almost every element that was in the original. Just having Starfox 64 on a handheld is honestly enough reason for most to pick this one up, but the newly orchestrated soundtrack, stunning 3D visuals and extra gyroscopic control scheme work wonders to make this title feel “new” again. Unfortunately, the lack of online multiplayer feels like a misstep as if any game would have been perfect for that inclusion, it would be Star Fox 64. With that said though, this 3D port is still worthy of attention as it not only makes Fox McCloud and friends relevant again, but also cements this title as yet another cornerstone in the 3DS’s growing library.